John Barbirolli was born in London in 1899 to an Italian father and a French mother. He began playing the violin at the age of four with his father, who had himself been a violinist with La Scala in Milan, but opted for the cello at a very early age. He gave many concerts as a soloist and performed with orchestras – notably under Elgar – and quartets. He made his conducting début at the Royal Opera House in Newcastle in 1924, and in 1928 began conducting the British National Orchestra at Covent Garden. In 1936, he was chosen over Wilhelm Furtwängler to succeed Arturo Toscanini at the head of the New York Philharmonic Orchestra. In 1943 he was spared a tragic fate by deciding to exchange his airplane ticket back to England with the actor Leslie Howard, who wanted to postpone his flight by a few days. Barbirolli’s plane landed safely; Howard’s was shot down. The same year, he helped save the Hallé Orchestra in Manchester from dissolution, and conducted it for the rest of his life. 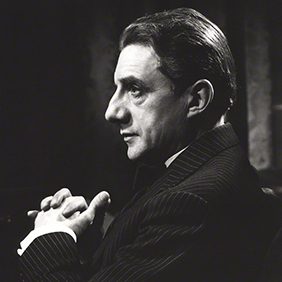 Sir John Barbirolli also conducted the BBC Orchestra and the Symphony Orchestra, as well as the Berliner Philharmoniker and the Wiener Philharmoniker.